Growing up, my best friend believed in the Jersey Devil. Truth be told, I'm fairly sure he still does. As my friend is a pretty stable guy otherwise, I'd have to say that this unrational belief in a mythical creature really shows the power that this type of folklore has. What makes intelligent, rational people believe in the existence of these types of beings? After doing a bit of research on the subject, I found that all of the "evidence" of the existance of the Jersey Devil is sketchy at best. 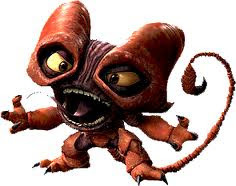 Belief in this creature stems from various stories of a devil child being born to a woman somewhere in New Jersey. The location of the supposed birth varies from story to story. In many versions of the story, a woman (often named Mrs. Leeds) wished that her next child would be a devil out of frustration and simply got her wish. Other versions claim that Mrs. Leeds was a witch, and that the child's father was a demon, or the Devil himself. 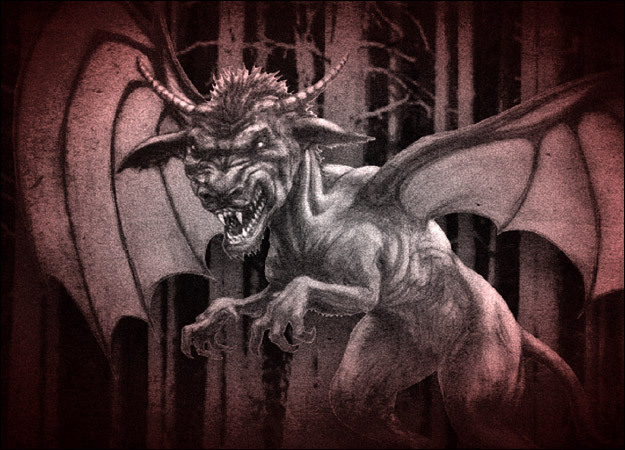 Supposed sightings of the Jersey Devil are just as unbelievable. Over the last two to three hundred years, people have attributed the Jersey Devil to animal mutilations, property damage, and hoof prints. There has never been any real, substantial evidence suggesting the existance of this creature. If that is the case, then the question still stands: Why do people believe? The Jersey Devil falls into a category of "crytpids" (from the Greek "krypto," which means "hide"). A cryptid is a creature that is thought by some to exist, but whose existance is deemed highly unlikely. Other popular cryptids include the Yeti, Unicorns, and the Loch Ness Monster. Go ahead and read that last sentence again. The Jersey Devil falls into the same category as Unicorns. Some psychologists have suggested that the belief in demonic creatures has to do with our desire to externalize our problems. Beliefs in things like the Jersey Devil allow us to create an external force that is the embodiment of the things they represent. In this case, something like the Jersey Devil would represent fear, cruelty, and evil. Additionally, people who tend to look for supernatural explanations to things are obviously drawn to these types of beliefs. Then, of course, there are gullible people, who will believe the "evidence" provided for the Jersey Devil's existance. Whatever the reason, since the existence of the Jersey Devil can't necessarily be disproven, people will continue to believe the tales. As strange as it seems, if human history is any indication, this type of myth and folklore will always be a part of our society. I really enjoyed reading this great informative post! I could never really understand how so many people could believe that the jersey devil exists and now I know why. I live in the South Jersey area and growing up i have heard many variations of the stories of the 13th Leed's child. However, now i just entertain it as a local folklore. But it is true that because of the superstitious nature of humans and our unconscious drive to have an explanation the legend of the Jersey Devil will persist with no proof and no evidence to disprove. I think a big reason that many of these cryptids persist without any evidence is not only because some people are gullible but because other people can make profit off of them and continue to insist on their existence with shows and sighting tours and the like. My girlfriend is actually a descendant of the Leeds family. Her grandmother is a Leeds and her great uncle, Harry Leeds, has been on multiple television shows in the past talking about the story of the Jersey Devil and its origin. Unfortunately, he recently passed away.